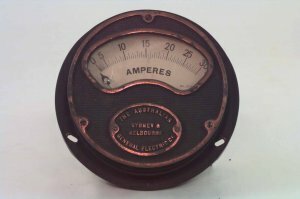 Black enamel cast iron wall mount moving iron ammeter, 30 amp full scale. In the cut-away diagram below we can see the two iron pieces, one fixed to the body of the ammeter and the other to the needle spindle. The current that passes through the coil induces a magnetic field inside the coil inducing poles in the iron pieces which causes them to repel each other as the current flow increases. As one iron is fixed and the other is attached to the needle, the needle moves around. The calibration is achieved via the vertical adjustment for the response (or the non-zero calibration). The adjustment that is in line with the needle is for the zero point calibration. The restoring force is gravitational. 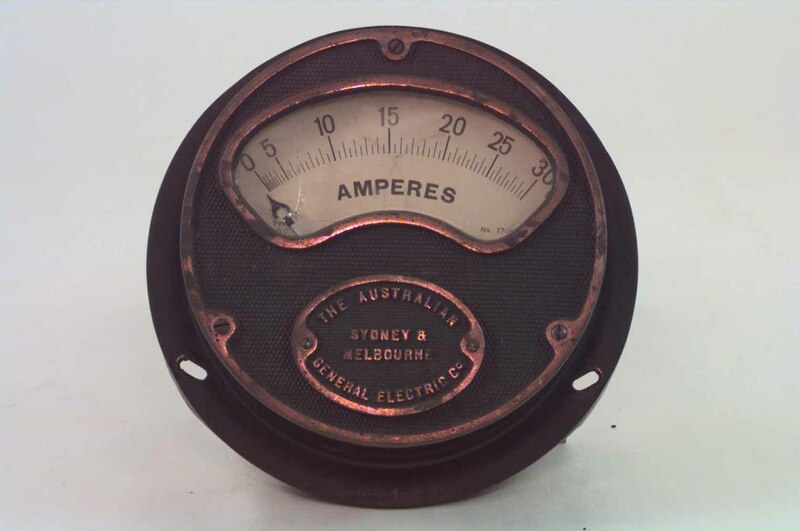 The air damping is achieved using a tube closed at one end and fixed to the body of the ammeter with a plunger fixed to the needle spindle thus damping any movement of the needle and giving a more controlled and balanced response to current variations.